MENNEKES HMI Series switched and interlocked receptacles provide safety, durability and convenience all in one unit. These pre-wired units feature a 20A pin and sleeve receptacle and a patented interlock mechanism to prevent the switch from being turned "ON" unless the plug is fully inserted. The plug cannot be removed unless the switch is in the "OFF" position, supporting operator safety under load. 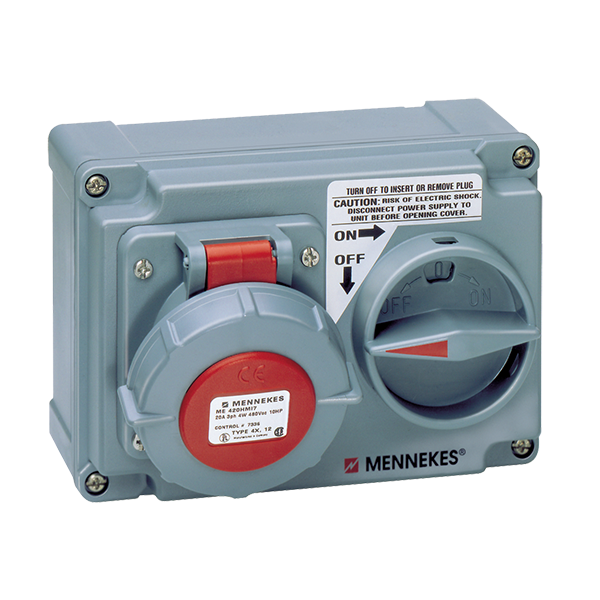 The non-fusible units come in a chemical- and impact-resistant NEMA 4X VALOX™ enclosure. And, IEC 60309-2 compatibility and wall mounting options make integration easy.